Built more than 4,000 years ago, Egypt’s majestic pyramids are one of the wonders of the world. Discover them—without the self-drive crazy—on a private guided door-to-door tour of two of the best-known pyramid sites: Giza and Saqqara. 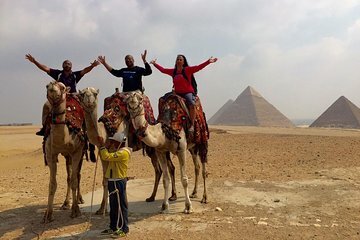 See the three Giza Pyramids, the Great Sphinx, and the Valley Temple; ride a camel across the desert; and tour the Pyramid of Djoser, which shaped Egyptian building styles for centuries.